Whit and I stayed at a Buddhist temple Saturday night. There is so much to tell you about it, I’m not sure where to start. We headed out of Gwangju Saturday morning for it’s homophonic partner, Gyeongju, where we almost ended up one time when we were trying to get back to our own city. It’s about four hours east of us, near the coast. I had made reservations for us to do a temple stay, a popular program for foreigners in Korea where you stay at a Buddhist temple to learn more about the culture. After seeing so many gorgeous temples in Thailand, we wanted to check out their Korean counterparts. Thai and Korean Buddhists are very different. The Thais are pacifists. 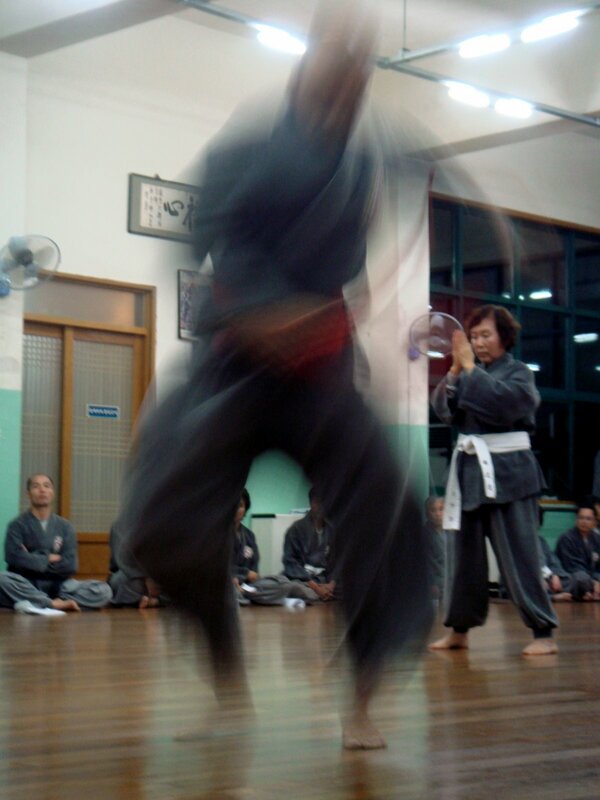 The Koreans have martial arts tied in closely with their religion, which was brought in from China in the early 6th century. Far from being pacifists, Korean monks were always trained in martial arts and played a major part in resisting the Japanese invasions in the 1590s. So we weren’t sure what to expect when we arrived in the very pastoral city of Gyeongju, a city I would recommend that everyone visiting Korea to visit. From the city center, we took another bus to the temple with the help of some kind Koreans. At the bus stop for the temple, we had to walk another 15 minutes to reach the temple gate, located in the mountains just east of the city. 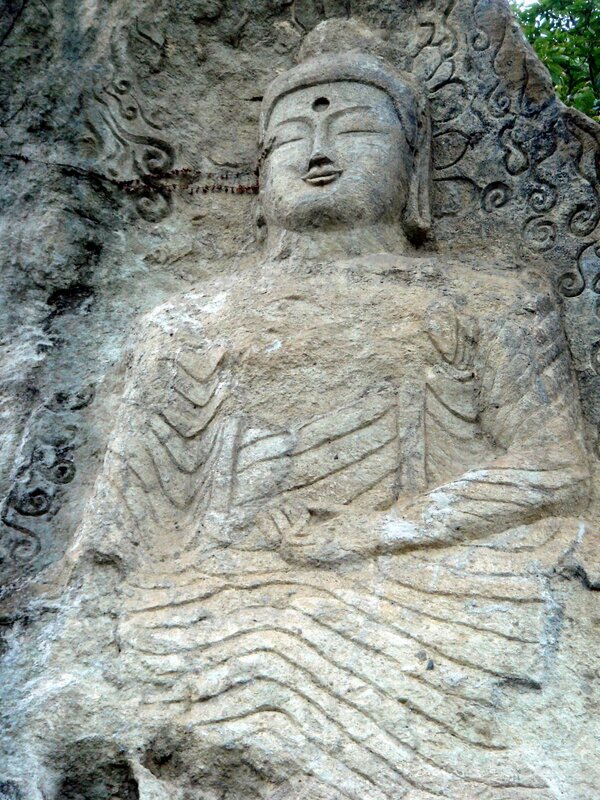 This temple, called Golgulsa, is known for its Buddha carved in the mountainside, which dates back to Korea’s Shilla dynasty in the 6th century. In other words, it’s the oldest thing we have ever layed eyes on. 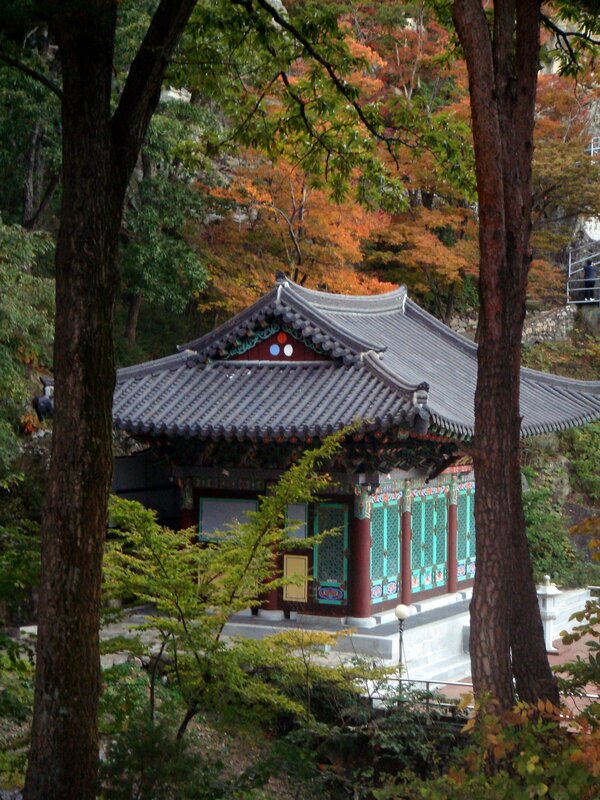 The temple and its monastery is known for martial arts, called sunmudo. Whit and I checked in and put our bags in our rooms. We could not share a room at the temple, so I ended up bunking with a 22-year-old Korean girl, and Whit bunked with her high-school-aged brother. We slept on the heated wooden floors with two blankets and a pillow each. But let me back up some. We had dinner with the monks. But not really with them. The men sit on the right. The women sit on the left. Always. They have the same meal every day for breakfast, lunch and dinner: rice, kimchi, soup, vegetables. It was a good meal, but I certainly can’t imagine eating it every day, three times! After dinner we had our lesson in sunmudo, which was really cool. We sat on mats on the floor and had to bow a gazillion times and chant with the head monk before we started. Again, the women were on the left, the men on the right. The martial arts was challenging but fun. We punched, kicked, squatted, did push-ups, situps, arm things, and all the while, making it look like a crazy cousin of ballet. I woke up sore today. My arms feel like I have been skiing back and forth across Sale Creek for the first time in the summer. My whole body aches. But I think that’s also because I slept on the floor. W e went to bed at 9:30, right after our martial arts training. My roommate and I talked for about 30 minutes. She is studying tourism at a university in Ulsan, near the eastern coast. I thought she might be shy toward me, like many Koreans are, because of her limited English. But she pulled her blankets close to my mine, layed on her stomach, kicked up her feet and we talked like high school girl friends. Whit’s roomy was nice, as well. They talked for a little while. Just before they turned the lights out, Whit told me, the young Korean told Whit how handsome he was. Which made him a little nervous and gave me a good laugh the next morning. The morning came early. We were awakened by monks chanting, singing and bonging on a drum as they walked past our doors at 4 a.m. –when the cosmos are awakening I am told. We quickly got dressed and headed to the temple for morning chants and meditation. I can’t tell you how difficult it is to sit cross-legged for more than 30 minutes. My meditation was spent wondering why Asians are so good at this. Yes, deep thoughts. I looked over at Whit on the right side of the room (Again, I was on the left), and he looked as uneasy as a prostitute in church. His eyes open, he re-adjusted his legs, gave up on the Indian-style, and pulled his knees to his chest. I went back to wondering why Asia is such a sitting culture. I read in a book last week that it dates back to the creation of their ondul heating system, which they still use today. (We have it in our apartment). Water is heated in pipes beneath the wooden floor, making the floor and room nice and toasty. I love it. And apparently, they do to. They have been sitting, squatting and lying on the floor ever since. After the excruciating meditation, we got up for a half-hour walking meditation, where we walked up and down the steep hill to the temple in the pitch black. It was so cold outside. But the skies were clear and the moon and stars shined brightly on us. 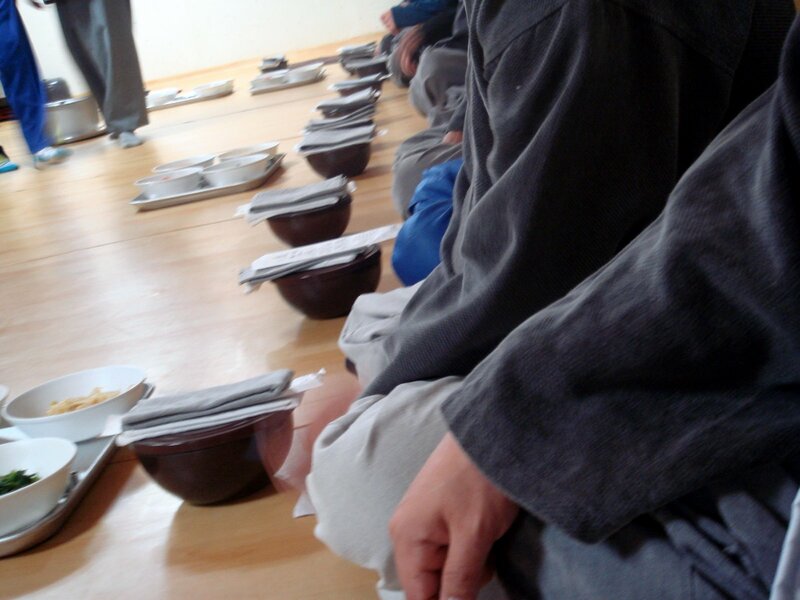 Sunday is a special day at the temple, where the monks have a special breakfast called paru-gongyang. We had to have 30 minutes of training in it before we even allowed to take part. Though I was really nervous about it, the experience was my favorite part of the temple stay. We all sat lined up in perfect rows on the floor with no tables. We each had four bowls, which were neatly stacked inside each other. We filled one small bowl with cold water. Next, a monk came by and served each person with rice. He bowed and we bowed. Then another came by with soup. He bowed and we bowed. Then we served our own vegetables, including at least one piece of kimchi. We were only allowed to take what we could eat. You cannot leave food on your tray. And here’s why: When the head monk finished his meal, he beat a gong, the sign that we are finished too. I knew about this ahead of time so I ate like a prisoner on a five-minute dinner break. With the water in your bowl, you have to clean out all four bowls, washing the sides and then dumping the dirty water into the last bowl. Which you drink. I really had to prepare myself mentally for this one. I absolutely hate mixing foods, especially with water. I made sure that I ate everything that I absolutely could not eat mixed with water at the end. But I ate so fast that I finished it all, out of my nervousness. I still had to drink some water muddled with kimchi spice, a little leftover soup and the crumbs from the other bowls. And with the one required piece of kimchi, we wiped off each bowl and then ate it. The whole practice is a time of silence when you are supposed to reflect on the need for order, harmony, and respect and compassion for the people who have made the meal possible. We spent this hour at breakfast again cross-legged, and now I was at the point where I didn’t think I could stand up. We were supposed to have tea next, another time of crossed-legged sitting and I finally had to draw the line. Whit and I escaped a little early so we could catch the early bus back to Gwangju. The next one didn’t leave until 4 p.m., which would have meant a really long day, not including the fact that we got up at 4 a.m. Plus, I had come down with a case of the body aches from the sunmudo and a head cold. It was definitely an experience like none other. 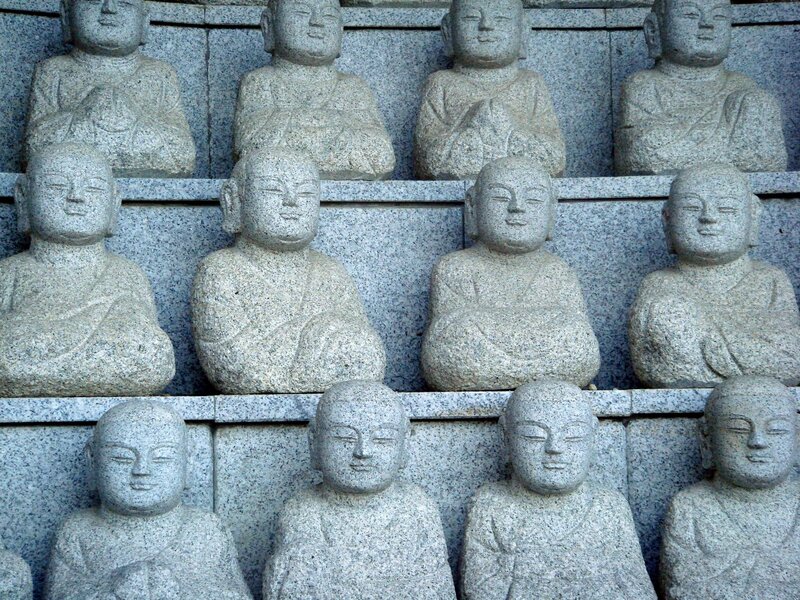 We got a good glimpse at Korean Buddhist culture. But I am so happy that I will be sleeping in a bed tonight and not getting up until 7 a.m.